Pictograms – miniature graphical representations of states, actions and objects – made their way into the mobile Web over 15 years ago. Several normalized (UNICODE, WAP) and proprietary (Japanese emojis, Openwave) mechanisms are in place to enrich Web applications with pre-defined images. Numerous devices do not support any standard pictographic facilities at all. Many others do not implement all symbols of the reference sets; fall-backs are therefore needed to cope with missing elements. A service may require images outside normalized dictionaries, like the sign for RSS feeds or the indication of a hidden navigation menu . They can be inserted in HTML and CSS markup and manipulated like normal textual data (alignment, scale, colour, effects). Once installed, they are persistent: they survive the end of a browsing session and the attendant flushing of the client cache. They are accessible to all mobile Web applications running on the terminal: different Web pages need not load and store their own version of the icons – just as each municipality need not define its own variant of traffic signs. In the following, we describe common methods and discuss their applicability. While the topic is treated in a resolutely mobile perspective, all techniques carry over directly to desktop Web development. Android Overwrite system fonts in folder /system/fonts. Requires a device management tool (ADB from the Android SDK). Requires (possibly transient) root privileges. Bada Custom fonts can be added, but the system typeface itself appears to be non-replaceable. Requires a device management tool (Kies and sTune). Blackberry 7.x Copy new fonts with a .font extension to folder /Device Memory/appdata/rim/fonts or /store/appdata/rim/fonts. Then change default font via the “Options – Screen and Keyboard” menu. iOS Overwrite system fonts in folder /System/Library/Fonts/Cache. Application-specific fonts that do not replace default typefaces are made known to iOS by editing a configuration file. Meego Overwrite system fonts in folder /usr/share/fonts/nokia/Nokia Pure/proportional. Nokia S40 Reflash the device with a modified firmware substituting system fonts. Symbian Copy new fonts to folder /Resource/Fonts on the memory card, and rename them to match existing system fonts (which themselves should not be disturbed from the device built-in system memory). Old versions of S60 only accept fonts in the format GDR; translation from TTF is achieved through the tool KVT Symbian Font Converter. WebOS Add new fonts to folder /usr/share/fonts. Custom fonts overriding the default typeface must have a matching name. Requires a device management tool (WebOSQuickInstall). Requires root privileges (development mode). Windows Application-specific fonts can be added to Windows Phone 7.x, but the system typeface itself is non-replaceable. On Windows Mobile 6.x, copy new fonts to folder Windows/Fonts before editing the registry. Should the custom font be associated to a different writing logic (such as happens with many Asian languages), then keyboard layouts and rendering functions must be adjusted too, possibly affecting system libraries. A misconfiguration may well result in an unstable operating system, so all resources being altered should be backed up beforehand. Because of its intricacies, specialized utilities have been published to facilitate font installation on popular devices (such as BytaFont for jailbroken iPhones). Nonetheless, the overall approach is only reasonably feasible in a controlled environment where handsets are configured centrally before being distributed to end-users – such as in a corporation or a public administration. Since a Web font is always explicitly downloaded, all necessary symbols can be rendered even if the end-user re-configures the terminal with an unexpected default typeface that does not comprise the required glyphs. Since a Web font serves to style textual elements explicitly, it can be designed so that its symbols are judiciously placed in the UNICODE space – for instance within the Basic Latin block. This is valuable whenever the client does not recognize code points outside the Basic Multilingual Plane. Practical Web services for converting a font definition into several formats, with the associated CSS font-face declaration, can be found at font2web, fontface and fontsquirrel. Another free online font converter can be found here. The Web Local Storage mechanism of HTML-5 serves to manage key-value pairs kept persistently on the terminal. This makes it possible to avoid downloading graphical resources anew at every browsing session, as happens with Web fonts. The approach can be applied effectively to resources other than pictograms – such as static pictures that appear repeatedly in a Web site. It consists of storing images as BASE64-encoded strings locally, and, subsequently, retrieving them to fill in placeholders for pictograms in the HTML pages before these are rendered. // already present to avoid useless re-installations. // instead declare it statically as an array here. // update the version as a last step. // Give up immediately upon a problem. // eval() call can be used. // Whatever happens, initialize images. // No local storage, so initialize to fall-back images. Every page featuring pictograms defines a function that, when window.onload fires, walks through every img element, checks whether it belongs to class picto, and if so, fetches the appropriate BASE64 string and assigns it to the src attribute. If data cannot be found in the local store, a URL to an external bitmap is used instead. // those identified as pictograms with a proper value. // Retrieve the right BASE64 string stored locally. // Initialize img element with BASE64 string. // back is a normal URL to an external bitmap. Absent the local Web storage facility, one can still rely upon BASE64 encoded images to deliver pictograms to terminals. Placing them inside a style sheet is preferable, since the CSS file can be cached and shared among several pages, whereas the direct inclusion of static strings in HTML results in code duplication and ultimately larger payloads to be transmitted over the air. /* Reserve exactly one em white space for each pictogram. <a href="tel:+41446313111" alt="call" class="picto-phone">press centre</a>. Developers will have no difficulty finding an abundance of on-line services converting data files to BASE64 strings, as well as a few standalone programs (notably datauri). More advanced utilities parse entire CSS style sheets, extract URL to external media, and replace them with embedded BASE64 data; a couple of examples are spritebaker (on-line Internet service) and cssembed (standalone command line tool). The possibly oldest materialization of Web sprites may not be as well-known as CSS background image sprites, but it optimizes graphical resources to a comparable degree. It is especially well-suited for elements that are all identical in size – a constraint unlikely to prove troublesome in the case of pictograms. If one can afford the software brittleness induced by pixel-oriented declarations, then CSS background sprites may play a role – particularly when optimizing purely decorative assets such as graphical separators, repeating background textures, or when tailoring bullets in unordered lists with icons. Interestingly, these customization capabilities are also supported by old-fashioned built-in pictograms of the Openwave browser. There are numerous on-line sprite generators, configurable interactively (alignment and padding of icons, colour table, image output format, etc). This site lists a selection of such utilities. SmartSprites is a more elaborate tool to produce CSS sprites and manage the accompanying style sheets. A tutorial on sprites can be found here. Unsurprisingly, this technique entails practically none of the performance benefits associated with built-in pictograms. The matrix below assesses the compatibility of major mobile browsers against every solution described in the present article. The software versions under consideration encompass a broad range of device classes and generations. The table reveals that, while the SVG format is recommended for icons and pictograms because of the well-behaved properties of vector images under transformations, developers must be ready for a (still) relatively inconsistent support for this standard across browsers, and be wary of using full-fledged SVG instead of its “tiny” profile. Works directly on block-level elements, not on pseudo-elements. Only available on devices running Opera Mini. SVG availability depends on model, implementation often severely limited. Works in paragraphs, not within headings. Instead of firing up Gimp or FontForge to design custom pictograms, developers can simply look to the wealth of (typo)graphical resources available on the Internet. These two sites are the first stops for determining which typefaces implement a specific UNICODE block. Symbola is essentially restricted to ASCII, Greek and Cyrillic, but encompasses many more pictograms – including non-standard ones. Quivira offers better support for European and Asian scripts (e.g. Armenian, Georgian, Hebrew, Thai, Vietnamese), with a partial, but growing, set of pictograms. Both free typefaces implement mathematical signs as well as glyphs for musical notation and several ancient languages. Since their corresponding TrueType files weigh from 1.3 to 2.2 MB, these typefaces are suitable solely as system fonts. One must recur to specialized font packages, amounting to just a few KB to a few tens of KB, for binding downloadable resources to mobile Web pages. Fortunately, there is an expanding supply of such fonts, both free and commercial ones, professionally designed and covering numerous symbols. Overlapping collections are presented at css-tricks, owltastic, simurai and iconsguide. The set published by FatCow comprises some 3000 colourful icons originally intended for desktop applications. Several of them are used in the compatibility tables of the present article. Pixelated and BacktoPixel feature icons with a minimalist design and particularly small dimensions (10x10 and 9x9 pixels). One pictogram present in every standard: the symbol for making a phone call, generally used for click-to-call links. Two symbols absent from pictographic standards, indicating a hidden menu (the “navicon” or approximations thereof), and an RSS feed. Two symbols available in some optional dictionaries: the cog traditionally designating a “settings” menu, and a sign denoting photographic functions. There is a greater design and colour variability with icons, whereas fonts provide flat, black and white glyphs, to be livened up with CSS. Developers can mix and match symbols from various packages – including one's own pictograms uploaded from SVG images or SVG font definitions – and then generate both a set of image files and a Web font out of them. The Web font is produced in WOFF, TTF, SVG and EOT formats, with a CSS boilerplate for @font-face declarations and related rules. It is very compact, as it excludes superfluous glyphs. Characters are assigned to the Basic Latin Block, the Private Use Area, or individual codes in UNICODE. Image files are produced in SVG and PNG; corresponding sprites are also generated, with a CSS file containing the necessary rules to use them. One should of course study the relevant license for the permission to create and use derivative works from a font or icon package processed through IcoMoon. Beyond issues of portability, each mode of implementing custom pictograms produces subtly different representations. The screen dump below, taken from an Opera Mobile 12.0 session with an HTML-5 page exercising all four main techniques on the 105loops set, highlights their peculiarities regarding scale, alignment, and text formatting. 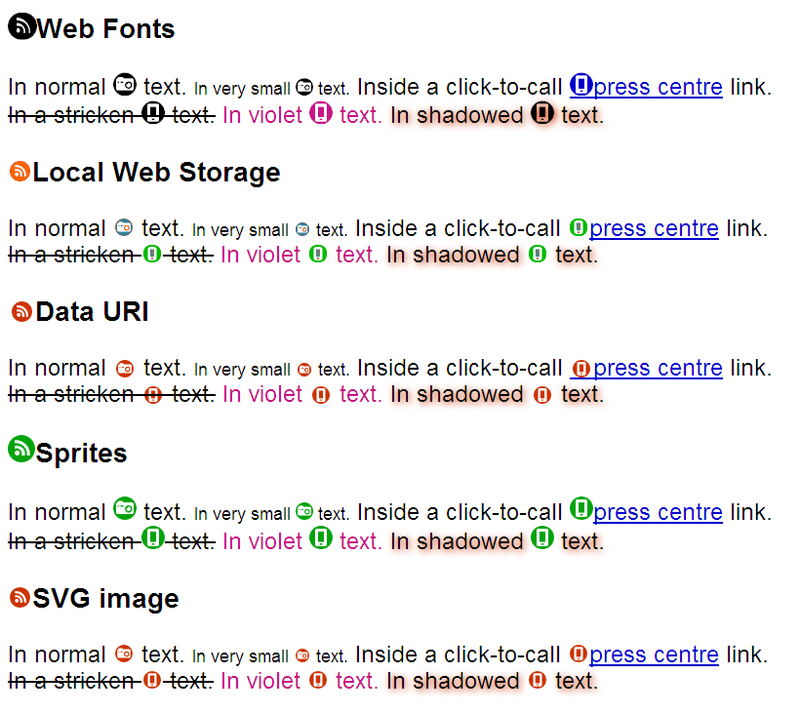 In this test, Web fonts are black by default, whereas bitmap resources have been painted in various colours. Only those used in the “Web Local Storage” test are polychrome – but images in “Sprites”, “Data URI” and “SVG image” could have been too. Mobile Web sites are geared towards delivering synthetic information on displays constrained in size, for immediate interactions in all situations of daily life. Pictograms stand out from the surrounding text, and thus quickly draw attention towards important content; they identify data elements, making it easier to skim a page for an item of interest; they supplement styling attributes such as colour and font when these become inapplicable (monochrome display, disabled CSS). Specify a meaningful alt attribute for pictograms implemented as external images with <img>, as well as for Openwave icons and WAP fall-backs. Assign pictograms implemented as characters to adequate code blocks in UNICODE – such as “Miscellaneous symbols and pictographs” – or to the Private Use Area, whose members are generally passed over by screen readers but correctly displayed by normal browsers. Support for ISO pictographs is becoming common in newer smartphones, but equivalent effects can be achieved on less well-endowed devices thanks to the methods explained in this article. Hence, nothing more prevents developers from taking advantage of pictograms to improve their mobile Web sites. Many thanks to Sriram Sridharan from ScientiaMobile Inc. for his help in testing Internet Explorer Mobile.